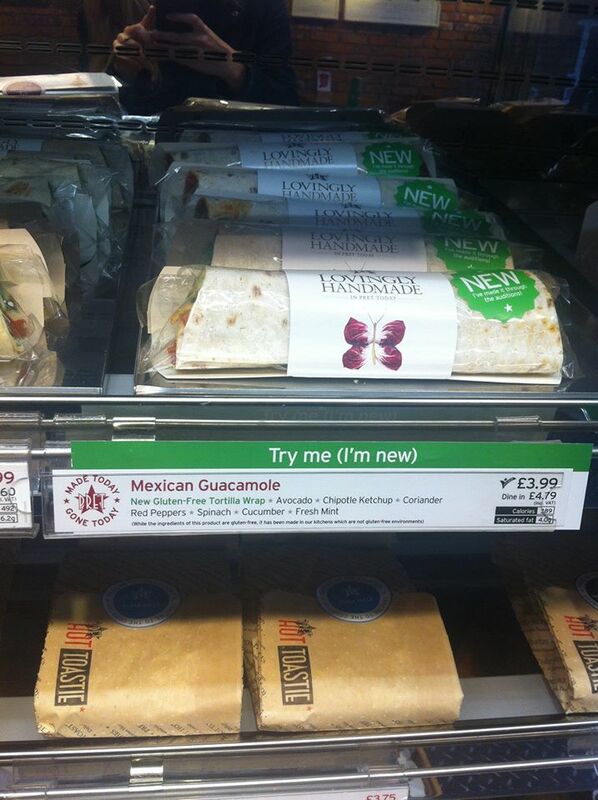 Last summer Pret launched the ‘Mexican Guacamole’, made with a gluten-free wrap. It carried a disclaimer: “While the ingredients of this product are gluten-free, it has been made in our kitchens which are not gluten-free environments”. Blogger Kevin at Gluten Free by the Sea queried their head office about it, was given basic explanation of hygiene / cross-contamination controls and told: “We can’t call it gluten-free because of the risk of cross-contamination”. The Mexican Guacamole wrap appears lately to have been supplanted by a Chicken Harissa, also made with a gluten-free wrap (which I understand is Newburn Bakehouse by Warburton’s, incidentally) but the Pret line on it is just the same, as they confirmed in an email to Kevin last month. His full account is worth a look. Read it here. Pret’s social media operators have been fielding queries on all these issues for months, not always consistently or correctly. 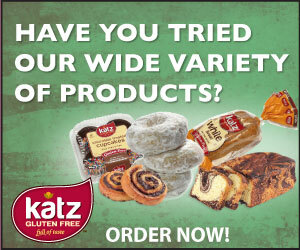 For instance, although they claim they can’t call their made-on-site products gluten-free, they regularly describe them so on social media, often linking to their allergen guide. Sometimes they call their Chicken Harissa ‘gluten free’ – and sometimes they say it’s made with a ‘gluten free’ wrap. When consumers ask them whether products are ‘gluten free’ – as all the ones below did – they often tell them yes – and then follow with a disclaimer. The message ‘made in kitchens which are not gluten-free environments’ is in my view fairly useless. Not many kitchens are ‘gluten-free environments’, and yet gluten-free meals can sometimes come out of them – although Pret seem to feel this is not presently possible in their case. Or perhaps I should say ‘guaranteeable’, rather than ‘possible’, because Pret seem obsessed with guarantees. Yet this expression is also inappropriate in food allergen contexts, to my mind, because there are no guarantees in life, as Kinnerton, producers of nut-free chocolate, clearly argue on their site. To me, it is a matter of confidence: does Pret have enough confidence, with the correct training and controls in place, and the willingness to put their neck on the line, and make a gluten-free claim? No, is the present answer. Or is it ‘yes’? Because they appear to be making those claims in conversation, and they also seem to be relaxed about allowing consumers to infer a product does carry a gluten-free claim when it may not. Take a look at the picture of the original Mexican Guacamole on Kevin’s blog. Nice large green lettering for the ‘gluten free’. Much smaller disclaimer. Lunchtime … distracted by colleagues … dozens of hungry office workers … in a hurry …. can you be certain you’d check, or is it easy to miss? And, for that matter, would those with all other sensitivities be able to ascertain the 14 allergens info too? I am not confident ‘gluten free’ is fully understood chez Pret. They told me days ago that “we only label products gluten free when we can guarantee [ARGH!] that they don’t contain gluten”. Newsflash, Pret: gluten free products can contain gluten. They can contain up to 20 parts per million. And “… don’t contain gluten” implies zero gluten – which is neither expected nor achievable nor measurable. Their constant references to ‘100% gluten free’ – or to not being ‘completely free from’, as on their Chicken Harissa page – or of their inability to ‘guarantee 100%’ tells me that they just, do, not, get it. I have blogged before about why ‘100% gluten free’ is misleading and – on labelling – illegal, and “We can’t guarantee 100% gluten free” is a car crash of a statement in a document purporting to serve as an ‘Allergen Guide’. Titling a page “I can’t Eat Gluten So I can Eat” and also making a gluten-related disclaimer appears to be a contradiction of one’s own choice of heading – and shows ignorance of coeliac disease. For it is coeliacs who are the ones who really “can’t eat gluten” (in concentrations greater than 20ppm), and it is they who need ‘gluten free’ labelling in the absence of gluten-related disclaimers. The term they are looking for – desperately – to describe the products under discussion here is “no gluten containing ingredients”. Why is this not being used? They should stop using the expression ‘gluten free’ with respect to these products unless there’s a ‘not’ before it. They should stop referring to gluten content, stop referencing percentages. And they should stop declaring themselves unable to guarantee the unguaranteeable. 14-allergen information should I feel be more accessible – I was unable to confirm that it’s available anywhere other than online. An appreciation that the cereals containing gluten are the allergens – and should be named – seems absent and needs to be addressed. Their advisory / defensive warning must change. Again, talks of ‘guarantee’ and ‘100%’ should be abandoned. The correct expression is for Pret to work out – they clearly need advice, and I understand they’re getting it from Coeliac UK – but it should be factual not speculative. “Although we take every reasonable precaution, please be aware that we use gluten-containing ingredients in our kitchens” is not ideal, but better than what they have. They need to appreciate that they are currently, in effect, making a broad “may contain allergens” declaration (albeit in an arguably cack-handed way) on all their on-site foods – as the ‘can’t guarantee that any of our products are completely free from any allergen’ disclaimer on their web pages demonstrates. As you can see below, the FSA are not keen on this sort of thing. “May contain” labelling should only be used, as I understand it, when there is considered real risk to the consumer – and if there’s risk to the consumer of finding crustaceans in their still mineral water or celery in their banana, as their Allergen Guide bafflingly suggests, then Pret are in far more of a mess than I’d imagined. They dont understand allergen. Vegan vegetarian and pregnant are not about allergens.straight question to them: can coeliacs eat here safely or not? If not can I bring my own boiled egg in shell baked potato skin on and banana unpeeled???? In regards to Anne's comment, I did scratch my head at Pregnant suitable foods not something I'd ever spotted before now but most allergy/dietary restriction menus incorporate vegan/vegetarian options & in my case I need this information. The menu layout online is the worst, I prefer the tick box layout most places seem to use. Really hard to cross reference between allergens when just looking for the name of the item on a very long list. I notice they disclaimer everything on that PDF not just gluten free. My local was closed for refurbishment otherwise I would have put staff to the test at the weekend, probably a lucky escape. Pret are just clueless and I am really pleased to see everyone putting pressure on them about this. It's all a bit confusing! I see they have taken down all of the 'gluten free' labels on their website from the products which previously had them (e.g. Soups) so they are obviously nervous, yet today they have announced today they are rolling out 'gluten free' four 'grain' (Chia? Amaranth? Quinoa?) porridge in their branches. It's presumably produced under same conditions as the soup, so I'm now very confused about whether I can eat there safely or not! Is it this one? http://www.pret.com/menu/pret_pots_desserts/five_grain_porridge_PUK5739.shtm – 'five grain'? On the site, they make dairy free and gluten free claim – but it's not guaranteed 'completely free from' – whatever that means. They're failing to understand that 'free from' with respect to gluten is now *defined in law*. Are they claiming it's 0-20ppm or not? Yep – confusing! Yep, they disclaimer lots of allergens on the PDF. Reason I concentrated on gluten was that 'gluten free' is defined – they do not seem to understand that it doesn't need to be 'completely free from' gluten to meet 'gluten free' standard … But the more you look at their PDF the more puzzling it becomes. Great post. I find the situation with Pret extremely perplexing. How can such a large company get it so consistently wrong? Take the case of their 5 Grain porridge mentioned above. It states on the Pret website that the porridge contains “pinhead oats” and within the same paragraph that it’s gluten free and dairy free. Upon further investigation with Pret via Twitter it transpires these are certified gluten free oats. Maybe all pinhead oats are gluten free, I don’t know. But if they are, I bet I’m not alone in not knowing this. Nowhere within the ingredients does it state they’re using certified gluten free oats. Had I not checked with Pret directly via Twitter, I would not have known. Aside from the labelling issue, I’m guessing certified gluten free pinhead oats come at a premium price, why not be clear with your customers what is in the food? And finally, I find it curious, in bold writing where I would expect to see “gluten free” and “dairy free” on the Pret webpage it states “suitable for pregnant women” alongside “suitable for vegans and vegetarians”. These “pregnant women” claims are weird. Do they label foods which are not suitable for pregnant women? Despite having conversed on Twitter with Pret on the 5 Grain Porridge and their response “thanks for the feedback, we’ll share it with the team” still the page on their 5 Grain porridge remains unclear. I really hope they get Coeliac UK in soon to help them. Pret have lost all credibility with me over their labelling issues. PS If I have time I’m going to check in a Pret store if the staff can explain to me why the porridge is labelled gluten free but the ingredients don’t clearly state that and see what the response is. I think, legally, but don't quote me, you can only call an oat-containing product GF if the oats used are GF themselves, so perhaps they didn't feel the need to make that clear? Speculation. I'm not sure whether this porridge is pre-packed or packed on site, and different rules apply … if the latter, full ingredients don't need to be given, but allergens need to be made clear (I presume oats are the only allergens present). Let us know how you get on at Pret. I didn't see any sign about allergens, and they couldn't show me a list of 14 allergens in their products when I asked – just their Allergen Guide, which does not do the job. I'm really confused now, but wouldn't risk eating here, never have. Only thing I've bought from Pret is a drink, bag of crisps and fruit. Not really a meal. I’ve just popped into a Pret to ask about the porridge and was told there were two types, one gluten free and one not gluten free. I was given a guide called “What Can I Eat” (or similar) and it lists under “gluten” all of the products which do not contain gluten. Every product sold in Pret which is free of gluten (notwithstanding the ‘can’t guarantee 100% disclaimer’ on each page) is listed. But only at a high level, i.e., the name of the product. This guide does not list the individual ingredients contained in each product Pret sells. I think this is the same guide you were provided with too. I asked specifically about the 5 Grain porridge which is the gluten free porridge, whether it contained oats (they weren’t sure), if they were certified gluten free (zero idea) and I asked if they had another guide in store which could tell me all of the ingredients. I was told this did not exist and I would have to look online. I’m confused too….I thought food outlets were supposed to make available to customers what ingredients are in their products? Surely telling someone they need to look it up online is not acceptable? One other point, if you have more than one allergy you would have to do some serious cross referencing between various lists to work out if you could eat something in Pret as they do not use a more useful tick guide with all allergens/suitability. I went into a Pret when it was quiet. Can you imagine doing this when busy and leafing through their guides? No thanks, there are many other food outlets who cater much better to those with allergies than Pret, thankfully. Yep, Sarah made the point abut the cross-referencing – it would be very difficult for multiple allergens to cross-check. Food outlets now have to make available the 14 allergens ingredients for their products (when not pre packed). They can provide this information online – but the trouble with Pret's website is that this information is not provided online – only the 'free from' / 'may contain' information is provided online – NOT the 'contains'. That said, surely the law can't expect everyone to have a smart phone in the store to check online? Surely Pret should be able to make this available, somehow? As far as I saw in my branch, they were also failing to signpost where allergen information could be obtained. A story to add to this: this morning I popped into Pret for a cuppa on my way to work, and unusually, they already had the "GF" wraps made up, so I picked one up (I've been eating them from my local Pret with no probs so far). They were the only wraps on that shelf and were behind the "Harissa Chicken" label. Just came to eat and opened the package to find something different – I think it was their avocado and herb wrap. Luckily I noticed straight away as the wrap was round and softer than the Warburtons one. Had I been more on autopilot I might have taken a bite before I spotted it. I've just been back and explained to someone in the shop. First he tried to say a customer must have put it back in the wrong place, but I pointed out there was only one pile of wraps out at 8.45. Then he was keen to stress that the one I was returning was veggie but the new one had chicken in it! Got a bit cross at this point and explained again that it was the gluten that was the issue, and that they really need to be more careful. Of course he looked at me like I was crazy customer of the day – clearly had no idea that there was anything of importance – just thought I preferred one over the other. Sigh. At least he let me off the £1.25 more that the chicken wrap cost. 'Every cloud', I guess, re: the £1.25 … But seriously, it's this sort of thing that would be less likely to happen if they did some sort of labelling on their on-site produced products. Although I understand it didn't happen in this case, there is a risk that products get shifted on shelves and returned to wrong place – without a dedicated 'free from' area it's even more likely …. Yep – their packaging doesn't even have the name of the sandwich on it, you have to look at the filling to work out which one it is. And the staff clearly don't understand the issues…. This is my email to Pret about the lack of labels on their packs of food. ……I would, however, like you to read to my experience of Pret and understand why the lack of labelling really makes things very difficult for customers like me who have coeliac disease, or other reasons for avoiding allergens. Not putting a label on your food means that I, and everyone else with a food allergy or intolerance, can’t eat it. Why? Because we don’t know with certainty what it is. Inside your cafes things are not much better, though at least there is some chance you might find out which product you have in your hand. Note I only say ’some chance.’ This is because in my experience I have quite frequently been given the wrong information, indeed in on one occasion I was handed something I could see was not gluten-free even though the person serving me said it was. If there’s no label on the food sometimes your staff can’t even tell what the item is. In your cafes products are picked up by customers and put back in the wrong place. It’s impossible for people to tell what they are. Sometimes the assistants don’t know either. It just seems crazy to me that anybody can even think it’s a good idea not to label food. Labelling the shelf is fine as a quick method of grabbing a sandwich, but as the only method of identification it fails totally. I hope you can see this. If you don’t have allergies or intolerances you’d never know how important this is. Please listen to your would-be customers here; we know what we're talking about. Brilliant letter, Sue. Any response yet? Enough social media users have made FSA aware of the situation, but not sure whether anyone has done it more 'formally' … Genuine question: Do you think 'making an example' would help – or would it be better (for compliance in general) to give them the help they so clearly need, and then use their case as a success story once their house is in order?